Kroger Co.’s first foray into the strand-alone restaurant business appears to be off to a good start, with positive reviews and reported waits of up to an hour at times for a table at Kitchen 1883 in Union, Ky. The restaurant debuted last month, just as Kroger is preparing to open the doors on its new culinary training facility in downtown Cincinnati. “2018 will be very exciting for us,” said Kristal J. Howard, a spokeswoman for Kroger, on the one-month anniversary of Kitchen 1883’s debut near the chain’s Cincinnati headquarters. The restaurant is part of Kroger’s new Hospitality Division, which falls under the purview of the company’s Culinary Innovation Team. That group also oversees the culinary training center and the Prep + Pared meal kit line, along with other culinary initiatives outside the deli, Howard explained. The culinary innovation team is led by Daniel Hammer, VP of culinary development and new business. The culinary innovation center, which is slated to open “very soon,” according to Howard, will be used to train chefs and help existing chefs from around the country share ideas, Kroger told the Cincinnati Business Courier at the annual shareholder meeting last year. Howard declined to discuss specific sales volumes or check averages at the concept, but said the fact that it is generating repeat business and filling up its 94-seat capacity for some dayparts are indicators of its initial success. The store is located adjacent to a Kroger Marketplace store, with its own separate entrance. In fact, Howard said the restaurant has rapidly evolved its own culture and will continue to be operated as a distinct entity from the supermarket. Kitchen 1883 procures from its own network of suppliers separate from the store, and is staffed and managed separately from the restaurant. The lunch and dinner menu is relatively small — seven appetizers, five salads, four sandwiches, four main dishes and three desserts, plus a four-item kids’ menu. 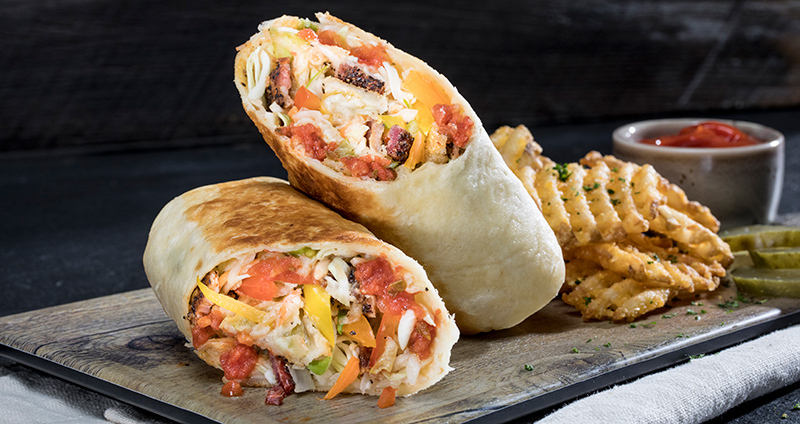 Typical of the current menu items is a chicken wrap, available grilled or crispy, with roasted tomatoes, smoked cheddar and an avocado Sriracha slaw, priced at $10. Mains include a pan-roasted pork tenderloin, served with horseradish smashed potatoes, blistered carrots, whole-grain mustard sauce and bacon-onion jam, priced at $17. The weekend brunch menu includes some of the same items with some additional breakfast offerings, including such trend-forward fare as shakshuka, a spicy Mediterranean egg dish, and ancient grain pancakes, along with a local favorite — goetta, a meat-and-grain sausage of German origin popular in the region. Kroger tapped as general manager Jay Denham, a veteran chef and culinarian whose Red Hog Butcher artisanal meat store and restaurant received accolades. 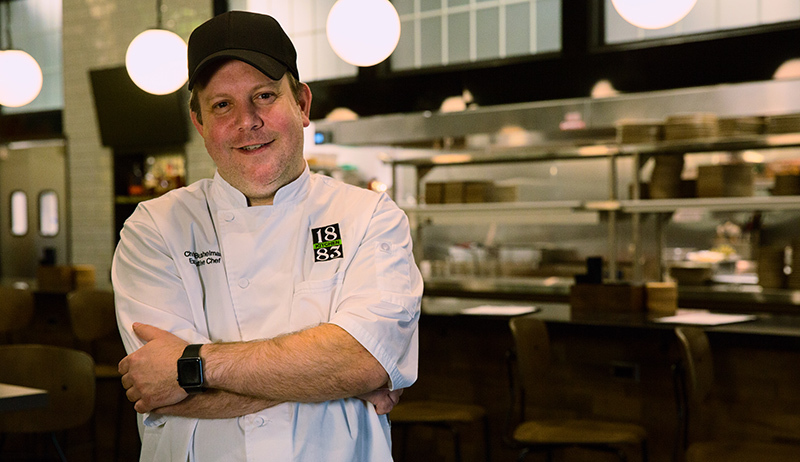 The executive chef is Chris Bushelman (pictured above), who most recently was executive chef at Incline Public House in Cincinnati and previously had experience in restaurant concept development with Restaurants-America and Fortney Hospitality Group, where he helped launched the national franchises of Brothers Bar & Grill and Bar Louie. Howard said she expects future restaurants to be adapted to local consumer demands, and it’s not clear yet if the Kitchen 1883 name will be used. “It’s potentially one one of many concepts,” she said. “What we learn from Kitchen 1883, we will apply that to future concepts.